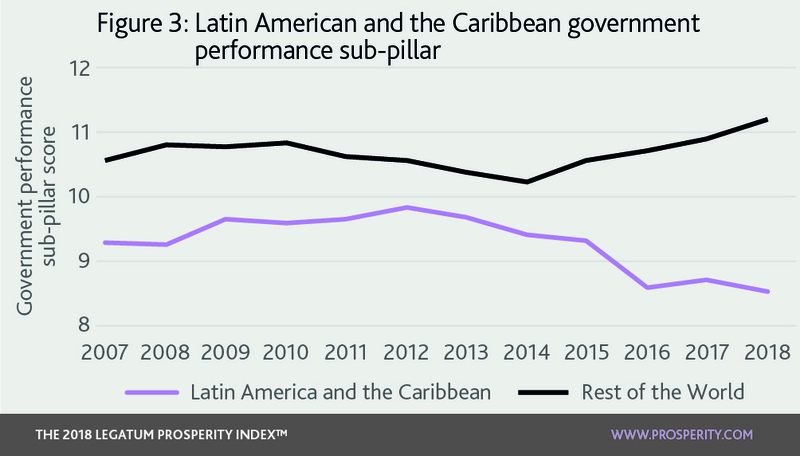 Latin America and the Caribbean is the third-highest ranking region in prosperity, but is being caught up by Asia and Eastern Europe. 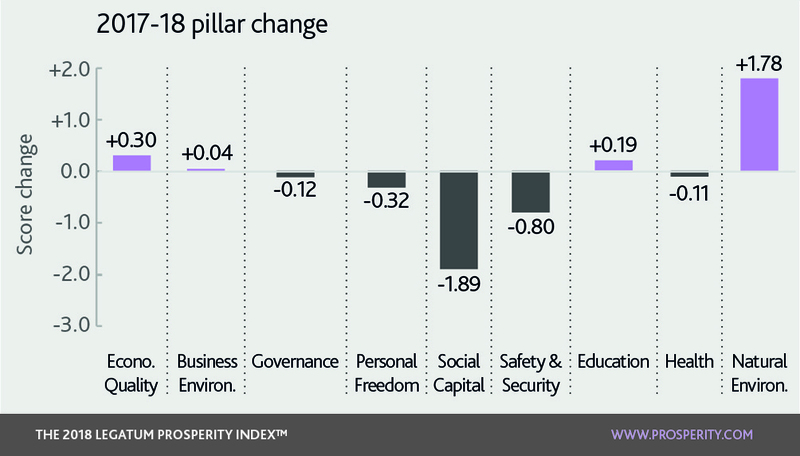 Prosperity in the region effectively stayed the same this year and levels are still just below the high point in 2013. The prosperity in the region’s countries remain closely grouped, with the exception of Venezuela, which is ranked 126th. Whilst 15 countries increased their prosperity over the past year, the biggest of the eight fallers was Brazil, by far the region’s most populous country, which brought the overall average for the region down. Safety and Security continues a decade-long fall. The largest falls came because fewer people reported that they had enough food and adequate shelter for themselves and their families. This is consistent with the trend of decline in the pillar since 2012. Last year the Latin American and Caribbean region improved most in the Natural Environment pillar, with all but three countries in the region increasing their score. Most of these gains came from improvement in wastewater treatment and an increase in marine protected areas. Colombia is one of the largest risers in the region, rising from 66th in last year’s report to 57th this year. While there have been substantial gains in the Safety and Security pillar with the number of civilian casualties from conflict falling dramatically following the peace agreement signed with FARC in 2016 between President Juan Manuel Santos and the Revolutionary Armed Forces of Colombia, Colombia still ranks 131st for Safety and Security worldwide. Over a longer period, its Business Environment, Natural Environment and Personal Freedom scores have all improved considerably. Paraguay, ranked 61st, increased its overall prosperity over the past year, with significant improvements in its Social Capital score. This was driven by more people volunteering, voicing their opinion, and more people saying they would help a stranger. For more, see our feature on Paraguay. Brazil, ranked 65th, fell in prosperity over the past year, and over the past five years it has been the third largest faller in the region. Economic Quality has worsened following a two-year recession in 2015-16 and stagnation in its reduction of poverty. Its Governance score has declined perhaps due in part to the Petrobras scandal and the ensuing political instability. It has, however, improved its Natural Environment score by protecting more marine areas. 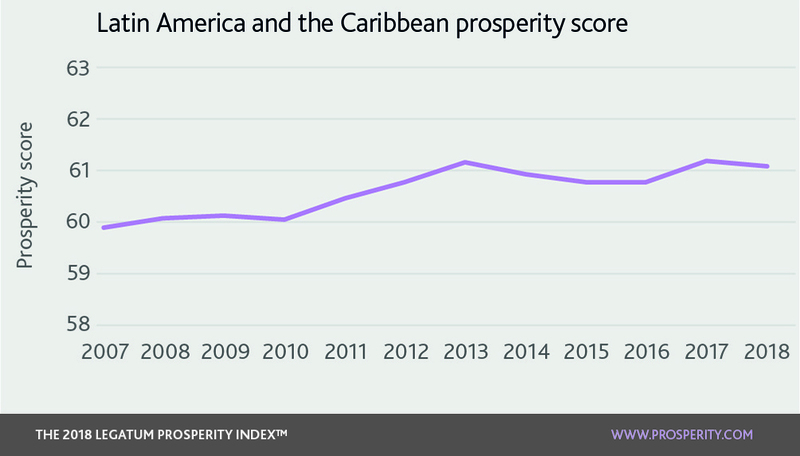 Jamaica has seen the greatest increase in prosperity in the region over the past five years and is the fourth biggest riser over the past year. This can be attributed to a better Natural Environment score, through a higher rate of wastewater treatment. Over the longer term, it has improved its Business Environment by making it easier to access credit and building stronger intellectual property protection. It has also seen increases in Personal Freedom (through greater social tolerance) and Governance (through improved confidence in elections and confidence in government). For a country to prosper, it must promote wealth creation alongside wellbeing. 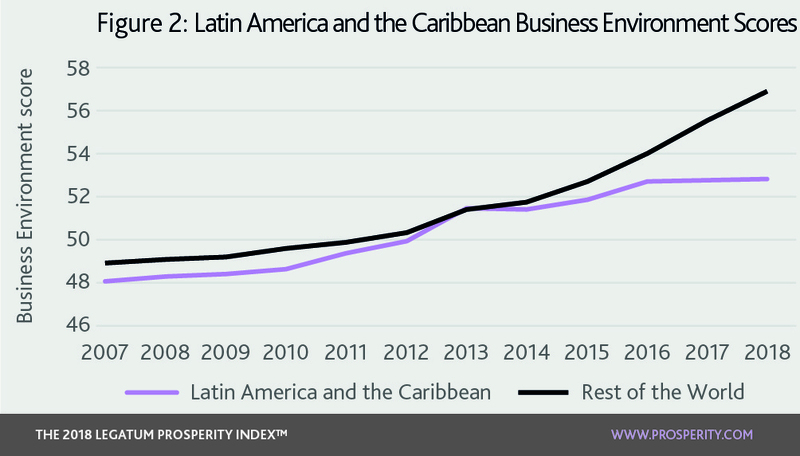 Despite being the third most prosperous region in the world, Latin America and the Caribbean faces major challenges in sustaining economic wellbeing. We see this first in the Business Environment pillar, which measures how well a country is promotes business and industry. The second pillar is Economic Quality, which is about how well a country’s economy is equipped for generating wealth. Finally, wealth creation depends on the Governance pillar, which is fundamental to attracting investment, and providing the environment for growth. The region comes fifth for Business Environment and has seen slower growth in this pillar than Asia, Sub-Saharan Africa, Eastern Europe and MENA over the last 10 years. This is largely due to the difficulties associated with starting a business. On this indicator, the region as a whole ranks last. In 11 countries, it takes longer than 20 days to register a business. In Ecuador, for example, it takes 49 days to start a business, compared to three in Jamaica, the region’s best performer. A second major weakness is labour market flexibility, where Latin America and the Caribbean is the worst performer. An inflexible labour market affects the productivity of firms and ability of people to find work. Executives in this region are highly critical of existing labour market regulations. Brazil, for example, is 148th for this indicator. The cost of redundancy is also high: in Argentina, for example, redundancy payments are equivalent to 30 weeks of salary, which ranks it 133rd for the cost of making someone redundant. These inefficient business regulations can push firms into the “informal economy”, where jobs are unlikely to be regulated, pension savings are unlikely to be collected, and wages are unlikely to be taxed. As a result, firms are often kept small, uncompetitive, and unproductive. 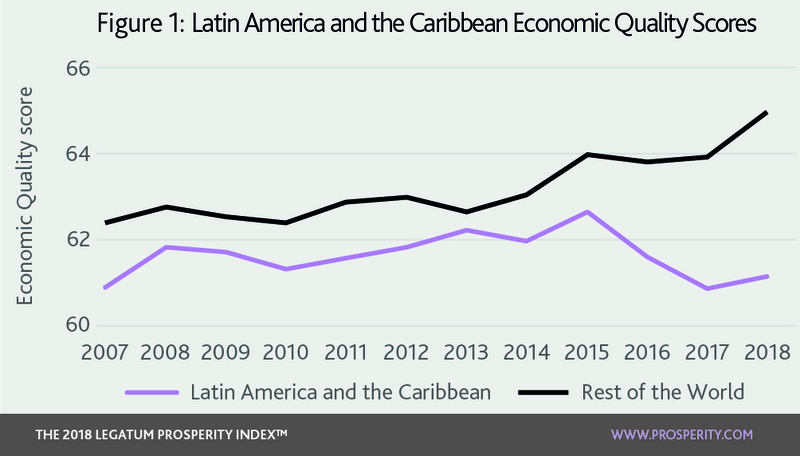 In Economic Quality, Latin America and the Caribbean is the fifth ranked region, and the only region to see a five year decline, caused by weaknesses across the pillar. It performs poorly in measures of trade: it comes last in perceptions of non-tariff barriers to trade. In terms of the quality and economic complexity of exports, it comes fifth out of seven regions on both indicators, and both have also been declining over the last five years. Beyond the unstable macroeconomic policy, one of the main reasons for decline has been the falling living standards in the region. Average real per capita economic growth has slowed over the last five years, and is now just 0.35% per annum. Brazil accounts for much of this malaise; it is home to one third of the region’s population and entered its worst ever recession in 2014. The economy shrank by 3% for two consecutive years, and has struggled to recover. This region also has significant challenges in confronting poverty. 3.6% of the population is in absolute poverty, and 25.6% is in relative poverty (sixth ranked region in the world). For example, according to Mexico’s own measures, 43% of its population is classed as living in relative poverty. Unfortunately employment, the major driver of lifting people out of poverty, is at low levels in the region. Unemployment has actually worsened, with 8.09% of adults in the labour force unemployed, up from 6.16% five years ago. During its recession, unemployment in Brazil doubled, from 6.7% to almost 13%. While the recession is now technically over, its unemployment figures are still the worst amongst its Latin American and Caribbean peers. But unemployment is also high in other countries: eight other countries have unemployment rates over 8%. The challenge is even more acute for young people in the area. For example, youth unemployment is 30% in Brazil, in Argentina it is 24%, and 17% in Chile. In its 2017 Risks Report, the World Economic Forum noted that for executives in Latin America and the Caribbean, the greatest risk for businesses was failure of national governance. Good governance provides a stable economic environment, as well as ensuring the correct reforms are undertaken to help businesses operate better. In this region, the picture is mixed. Latin Americans have the highest voter turnout in the world and the second highest proportion of female representation in legislatures. However, on other aspects of Governance the region performs poorly. On measures of government performance, the region’s score is low and declining. Just 26% of people have confidence in the government (the worst of all regions), with particularly poor scores in the largest economies, Brazil, Colombia, Mexico and Argentina. Many governments also face severe fiscal challenges. Argentina faces a large budget deficit and the Brazilian government is also running large government deficits, spending 34% of government revenue on interest repayments. Government integrity is also low (sixth ranked region in the world). Business executives rank many of the countries poorly for the transparency of policy making, and perceived corruption is rife. The region has suffered a number of corruption scandals recently. An example is the ongoing investigation into executives at Petrobras, Brazil’s state-owned oil company, which accepted bribes in exchange for awarding construction contracts. The scandal has affected several other countries in Latin America and has implicated several politicians. Another example is Peru’s president who, in March of this year, resigned after being found to be offering access to public works contracts in exchange for votes. In Guatemala, the President has been openly attempting to curb the authority of the state anti-corruption body. It has been suggested that these scandals have been driving distrust of the government, and some have noted that populist, authoritarian leaders are taking advantage of this mood. But others have noted that these scandals reveal a new zeal for tackling corruption. While an increase in corruption investigations can, in the short run, increase frustration in government, a sustained reduction in corruption will improve prosperity in the long run.